”Eat your fruits and vegetables” is one of the tried and true recommendations for a healthy diet. Eating plenty of vegetables and fruits can help you prevent heart disease and stroke, control blood pressure, prevent some types of cancer, keeps your eyes in good shape and the list goes on. And for all these reasons alone this is our #1 Habit. 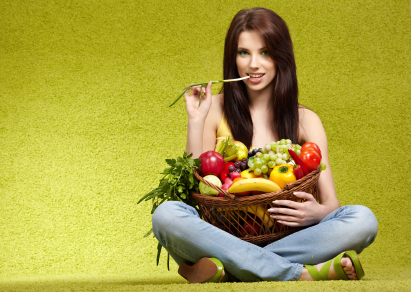 Whether you are a plant based eater or not your diet should be based around fruits and vegetables. Unfortunately most of us do not eat enough of them. The easiest way to meet this requirement is to include them with ever meal. My personal rule is to cover at least ½ of my plate with veggies and/or fruit. Go for a variety of kinds and colors of produce, to give your body the mix of nutrients it needs. Best bets? Dark leafy greens, tomatoes, and anything that’s a rich yellow, orange, or red color. I am a big fan of eating my veggies and fruit raw, however as you can see there are some cleaver ways to hide them inside cooked meals too. For those with sweet tooth checkout my recipe for delicious “Spinach Brownies” here. Ok, here is our first habit. I would love to know how you are doing with it so please post your questions, comments or challenges bellow.